our resources carefully to help those most in need. charity. Frassati knew that true charity meant serving the whole person and not just their material needs, like food and clothing, but to offer personal care by listening to them and offering encouragement. â&#x20AC;&#x153;I suffer from long-term trauma and when I came to Judy (CCWM therapist), I was 400 lbs. and my self-esteem was very low. With her support, I have lost a lot of weight, have kept my head up, and now I advocate for children in the community.â&#x20AC;? COMMUNITY IMPACT Below is a snapshot of the impact and partnerships that Catholic Charities had in 2018, throughout West Michigan. To learn more about our specific programs, please visit ccwestmi.org or call 616.551.5659. 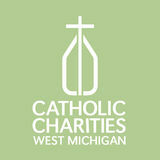 FINANCES Transparency in Catholic Charities West Michiganâ&#x20AC;&#x2122;s finances is very important to us. On these two pages, you will find assets, liabilities, and net assets as well as the breakdown of our revenue and expenses. EVENT HIGHLIGHTS Raising Hope Dinner The Raising Hope Dinner at Frederik Meijer Gardens & Sculpture Park welcomed over 400 guests, who heard powerful stories of impact from our key note speaker Ginger Zee and from clients in our behavioral health programs. The event raised more than $115,000 and hosted music by Roger McNaughton as well as delicious food and drinks from the Gilmore Collection. Soup’s On! The Soup’s On For All and Soup’s On Along the Lakeshore events hosted more than 1,000 attendees. The events raised over $115,000 for Catholic Charities West Michigan’s food and pantry programs and the proceeds helped feed thousands of people in Kent, Ottawa, and Muskegon counties. Thank you to those who helped out, volunteered, or attended the events! Let’s Go To Bat For Kids The Let’s Go To Bat For Kids softball game at Fifth Third Ballpark welcomed 4,000 attendees and raised more than $50,000 for Catholic Charities’ foster care and adoption programs. This free event featured a lively game between the priests, deacons and semenarians of the Diocese of Grand Rapids and local media members. New in 2018, we hosted a MVP Competition at Letâ&#x20AC;&#x2122;s Go to Bat, to see who could raise the most money for our foster care and adoption programs. The competition raised an extra $11,400 and Father Stephen Durkee took home the trophy! THANK YOU! With humble gratitude, the staff and board of Catholic Charities West Michigan thanks you for your support of our mission and vision this year! Each day, we work to feed the hungry, counsel those who struggle, and build strong families through our over 35 programs. 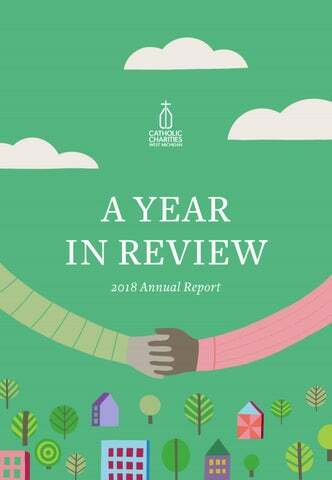 In this annual report, we hope that the contents were not just informative but are also affirming of your support for our work, which is unparalleled in its efforts to bring the mercy and love of Christ to everyone it serves. serve, and to teach our neighbors in need. that othersâ&#x20AC;&#x2122; lives can be improved. How To Contact Catholic Charities West Michigan Administration - 40 Jefferson Ave. Grand Rapids, MI 49503 For a full list of locations and contact information, visit ccwestmi.org/locations.